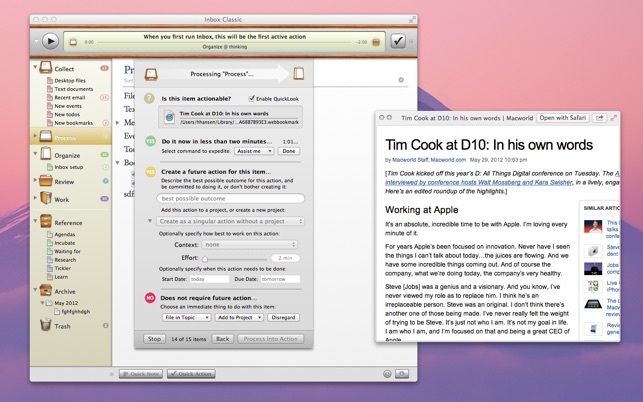 This is the original version of Midnight Inbox that brings Getting Things Done (GTD) productivity to the desktop in true delicious style, now updated for the latest versions of Mac OS X with native support for 10.6 and 10.7! And now available for free! Top to bottom, Inbox provides an automated workflow of simple input, intuitive organizing, and contextual outputs. Just jump right to the part that best fits your situation: from collecting your thoughts, to concentrating on your work. Getting to the bottom of your inbox is what this app is all about. As things pile up you need to get them sorted and acted upon; Inbox makes this quick and easy by giving you shortcuts to the places where things need to be, and the assistance to get them done. 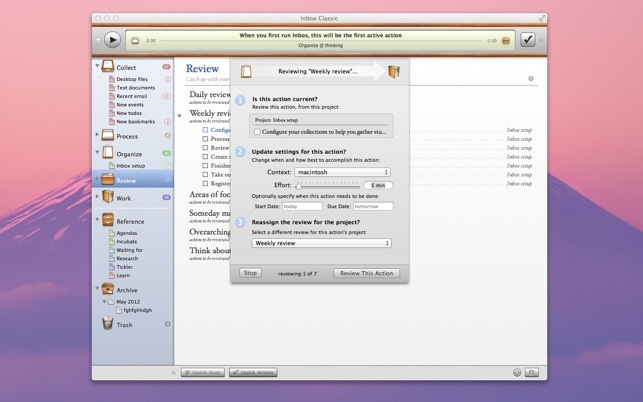 Midnight Inbox is inspired by the Getting Things Done methodologies created by David Allen. If you've never heard of GTD, just let Inbox be your guide. It will help you be stress-free, following the GTD workflow for you, so you can concentrate on what really matters. • Inbox Classic is -not- compatible with current iOS versions (Inbox Mobile for iPhone, Inbox Touch for iPad) for data or syncing. The forthcoming version "Midnight Inbox 2" will bring full feature parity and iCloud-based syncing to the desktop version of Inbox, and import of Classic version's data. • Support for Mac OS 10.4 and 10.5 and PowerPC-based Macs is available in version 1.5.1 of Inbox Classic from our Web site. It's elegant and has a lot of useful integrated features. This app is complex but, I think, very well thought out. It seems to be more user-centric than programmer-centric--which is usually my downfall with these kinds of apps. I absolutely need a planner but for every one I have tried I get tired of the learning curve and clunky input after a while and just stop using them. I really like the context referencing, seems to be a great way to keep stuff from cluttering up the day. The overall design is very comfortable (I am a graphic designer so as idiotic as it seems this is one of my major concerns with an app). If I can ever get the iPad away from my husband I will probably buy that version as long as it can sync with this one. While the set up may seem intimidating. It's worth it. Take the time to set up collections, process them and define your projects.. this app will greatly help your workflow. With the way it "Collects" it reinforces David Allens ideas of collecting everything and actually made me clean out my downloads folder and all the random stuff on my desktop. It handles the ideas of processing, organizing and reviewing extremely well without taking away focus on the actual work that needs to be done. Many apps you spend hours setting up and then never really check anything off. I've tried about every productivity and project management app that exists and was extremely impressed not only with the usability but also the interface and the organization of the app. I'd definitely recommend this app to anyone who seriously wants to implement GTD digitally as it guides you through the GTD systematic approach outlined in the books BEAUTIFULLY. The more familar you are with GTD, the easier this app is to use. Curious to see how much data this app will be able to manage, as I'm a designer and have hundreds of digital files folders that will become "to do" or "reference" items as well as a large number of projects, but thus far I have had no problem. This app has a LOT of potential, but does not sync with other Macs or the iOS devices. I have been waiting for version 2.0 which is supposed to sync with the iPhone and iPad versions via iCloud for almost a year and still no evidence it will be released any time soon. I read the recent posting on the developer support page, and I am glad they finally came out and explained the issues they are facing (kind of similar to those with Yojimbo). Can't wait for version 2.0 with whatever reliable sync method they chooses!!!!! ©2012 Midnight Beep Softworks, LLC.